There are many characteristics of a linchpin that I can relate to, but I'll spare you my self-analysis. 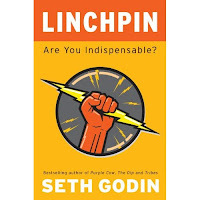 Instead I'll let you in on two secrets on being a linchpin courtesy of Seth Godin. "The law of linchpin leverage: The more value you create in your job, the fewer clock minutes of labor you actually spend creating that value. In other words, most of the time, you're not being brilliant. Most of the time, you do stuff that ordinary people could do." "The only way I know of to become a successful linchpin is to build a support team of fellow linchpins." 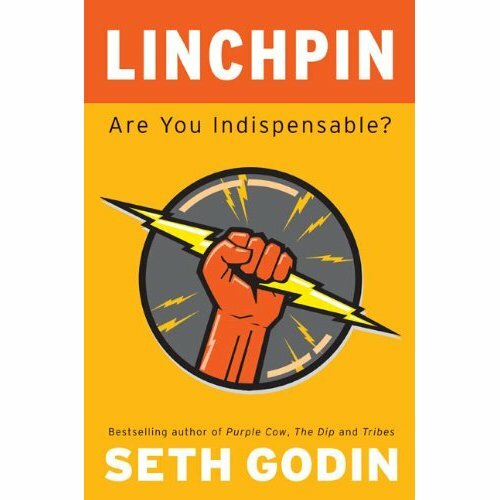 I picked up a copy of Linchpin by Seth Godin at the library a few months ago after I noticed several others reading it and mentioning it. I've only read through a few chapters whose titles grabbed my attention, but what I've read has been thought-provoking, challenging, and inspiring. With it being summer much of my reading has been in small chunks in many different locations (several different states) and I've lost track of a lot of my thoughts that I wanted to post. So, you'll just have to read it yourself. :>) I'd recommend "Becoming the Linchpin" for starters. "The Culture of Connection" is great as well with a confirmation of all of the collaborative work that we do. I guess what has struck me the most in my reading is both how necessary it is for me to be a linchpin in my role as an educator and how my own kids and my students will need to be linchpins to succeed in the changing world of work. If anyone else is reading or has read Linchpin, I'd love to discuss it with you. In the following TED Talk, Kiran Bir Sethi talks about how wonderful it is that the "I can" bug can be contagious. She describes becoming infected when she was 17, but wishes she was infected at age 7. So she started the Riverside School on the premise of "children being the change." It is interesting how the student process she described corresponds to what we learned from Comprehension and Collaboration last year. Students use inquiry to dig deep into the content/problem/issue, they work on solutions, and then they take it to the community. Lots of inspiration packed into a short presentation. Thanks for visiting my personal space on the world wide web where I share my perspectives on teaching and learning as well as random thoughts on daily life. As I fill the roles of a husband, father, and teacher of 4th grade students, please keep in mind that the views I share don't necessarily represent those of my family or my employer.